Expand trip titles below to see details of trips. For your convenience there is fast, easy online booking available, Or feel free to call our friendly staff to help you set up your perfect activity. This tour includes about 4.5 to 5 hours of On Snow Riding using our High Performance Ski Doo Summit 600 snowmobiles which are Single Rider Snowmobiles. Ride a ton of our 100’s of miles of trails and learn the art of riding off trail as well. 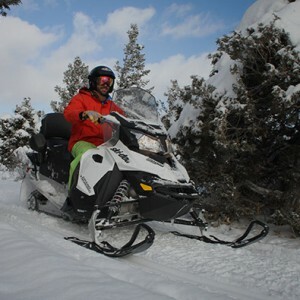 With so much time out there you will have a chance to start to master the technique of riding un-tracked snow.You will go places on our private mountain that most others have never been, climbing to nearly 11,000 feet. Lunch is a back-country camping style lunch, energy bars and other snacks along the ride. One Piece Snowsuits – However, we do recommend you wear ski clothing. 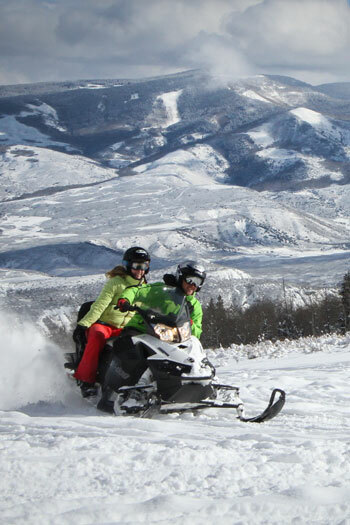 Snowmobile 100+ miles of custom designed trails on our private mountain and freeride in the bowls on an area that is larger than the Vail’s Ski Mountain. 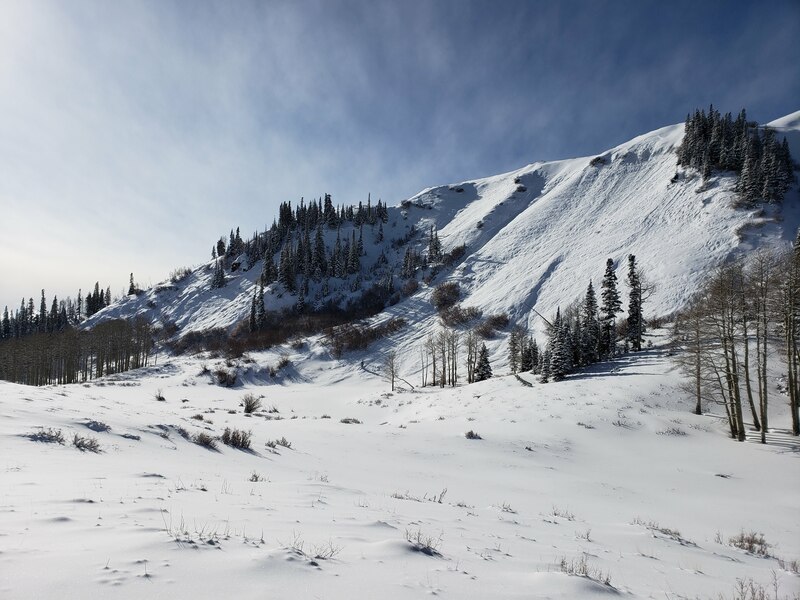 Climb 2400 vertical feet to high alpine ridges with views of 5 ski areas, 7 mountains ranges, and the continental divide, from above tree line at nearly 11,000 feet. We also have Goggles available to rent at our Mountain Base and a selection of accessories to purchase if you require other Winter Gear such as Gloves, Neck Gaiters, Etc. Other Age Requirements: Any individual under the age of 25 will need a Parent or Legal Guardian to sign the Rental Agreement Damage Contract for any damages done to the machine. All Minors under the age of 18 must have a Parent or Legal Guardian with them at all times during the tour. Older siblings are not considered Legal Guardians. You will be riding powder through trees, doing wheelies up steep faced cornices, jumping off drops, dragging your shoulder as you rally a perfect powder turn, and grinning ear to ear the whole time. 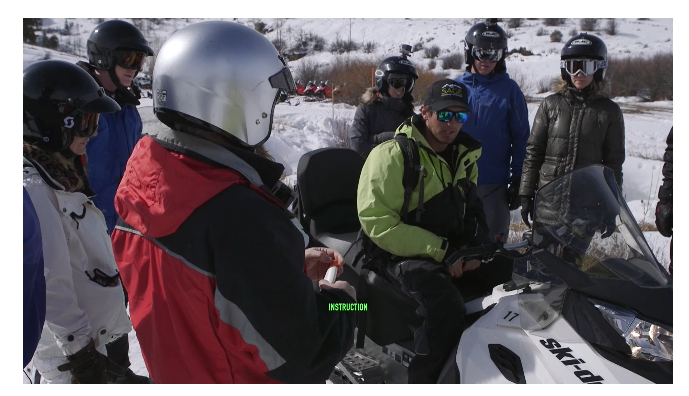 Our guides are some of the best riders in the area. They are here to teach and encourage you, not to hold you back. In fact, if you can out-ride your guide, you get the trip for free! Allow 4 hours round-trip for each tour time. Regular tours are in a group setting and you will have other people on your trip, likely strangers, whom you will hopefully get to know and befriend! However, If you would like a more private experience, we do offer Private Guides, Private Transportation and Custom Time Slots. $1,000 – Includes your Private Guide and up to 4 Drivers. 6 Drivers & 6 Passengers Max per Private Guide. If your group is larger you can add additional Private Guides for $300 Each. 4 Riders Max per Private Guide. or customary gratuity for your guide. We will provide the proper helmet - ski helmets are not allowed. 48 Hour Cancellation Policy - Any Cancellation within the 48 Hours is non-refundable. Cancellation Policy within 48 Hours - No refund on your original trip and Sage may offer a discount on the re-scheduled trip at our discretion based on availability. Changes outside the 48 hour time-frame are no charge and dependent on availability. 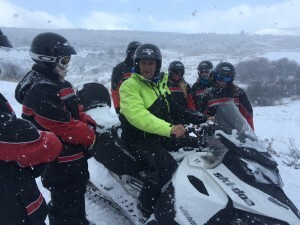 This also includes no shows and not using reserved snowmobiles on the day of the trip. 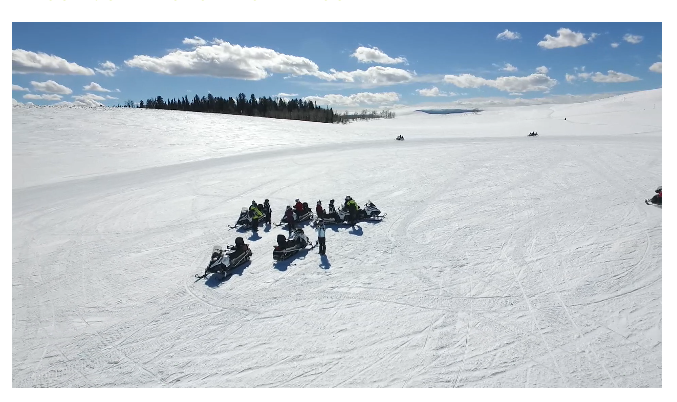 For example, If you reserve 4 snowmobiles and on the day of your trip you end up only using 3 snowmobiles, you will still be charged for 4 snowmobiles. Add-ons within 48 hours will be dependent on availability. We never overbook any of our trips. These policies ensure our ability to uphold our end of the reservation commitments. We look forward to playing in the mountains with you! This is considered a cancellation and you will need to make a new reservation for another trip. Sage at our discretion may offer you a discount for your new reservation based on availability and can not guarantee we will have space for your group. We offer complimentary transportation and will have other people on the vehicle. It is crucial that we adhere to our schedule to ensure excellent customer service. If you are not at the pick up area at your designated time, we will need to depart for other pick ups. Your trip is considered a no show and non-refundable. WEATHER - Sage Outdoor Adventures operates Rain or Shine, Snow or Sun, Hot or Cold. It is extremely rare that we encounter long lasting weather events that effect the quality or safety of a tour and therefore do not offer refunds for weather, nor do we reschedule trips do to weather.